I love to get emails and info about zines I don't know or I am not aware of, so please drop me a note! If you'd like me to list and link your zine, please include a small description of your zine (if there is none at your web site/zine). Please don't be mad if I haven't linked your site yet. In such a case, just write me an email and we'll fix that as soon as possible. Also, I do not like to list "real addresses". So please get a Postal box number and include that, or write me which distros are distributing your zine. It's for your security!! This list provides announcements, queries, and resources on grrrl, lady and transfolk zines and distros from all over the world. The list is a forum for people interested in talking about zines, feminism and the international network! I was born in the ”Women’s Year” in 1975 and grew up in Krimml in Salzburg, Austria (a village with 800 people in the Nationalpark Hohe Tauern in the middle of the Austrian Alps). After studying and living in Vienna, Durham (NC), Graz and San Diego (for 5 years from 2000-2005), I recently returned to Salzburg, a fairly small town close to the mountains and lakes (although very touristy). I see myself as a feminist activist, archivist and researcher who likes reading, travelling, rock climbing, surfing, tandem paragliding – and of course all things DIY feminist, such as zines, Ladyfests, buttons,…. ! So you might ask: How the heck did I get into zines? The first zine a friend handed me was Annikafish (by Sonja Eismann and Ute Hölzl) in 1998. They were talking about how we all want to be Pippi Longstocking but in fact we are more like Annika. I was thrilled! Soon after two friends and I started to work on a (maga-)zine in Vienna called female sequences: lesbenkulturHEFTig. It was a magazine for and about women and lesbians in Austria interested in contemporary feminist art, music, pop culture, literature, and youth culture. ( I left after the first issue but was published until its 5 th issue.) At that time I worked on my MA thesis and did research about Do-It-Yourself: Feminist artistic practice in Zines and Magazines. I interviewed artists from Austria and Germany who used (maga)zines as a platform to express their feminist views and a s a forum to exhibit their art instead of having to struggle with the male dominated gallery system. (for interviews check: Ina Wudtke from Neid, Regina Möller from regina, Heike Anacker from heikes läspencomics, Linda Bilda from NO Comics and Ilse Kilic from Rosa). When I began researching international grrrl zines on the Internet, I discovered that there were many personal web sites that listed them but that there was no central e-list or comprehensive resource site for feminist-oriented zines, let alone one with an international focus. Soon I had many bookmarks on my computer and so I decided to make my personal “archive” available for others. So I decided to create GRRRL ZINE NETWORK. I started working on the web site Grrrl Zine Network in 2000 and – since I had to learn web design and compile all the information - it took me until June 2001 to put it online. The focus of the web site are grrrl zines by which I mean zines with feminist viewpoints made by and for women, and queer and transgender folks. My overall goal for the web site is to share resources on grrrl zines in different languages, and to create connections between like-minded but often far-away feminist youth who read and produce zines. The web site currently (2008) lists around 2000 zines from more than 40 countries. I have also continued to conduct interviews with feminist zine editors and distributors, now from almost 30 different countries. I have also established a large archive of print zines which keeps taking over my rooms! I think zines are interesting because they reflect the unfiltered personal and political voices of people from different backgrounds, countries and interests. We don’t get to hear those voices – and especially those of girls and young women, women of colour, working-class women, queer and transgender youth - in mainstream, adult-run media. Historically, these voices have been erased and forgotten – and that’s why they are so important to document and preserve! Zines document not only people’s daily lives and their participation in social and political life but also the cultural zeitgeist and a certain historical moment. They are vivid and important examples of alternative self-publishing and grrrl zines will be important archival documents illustrating a long tradition of feminist alternative and grassroots publishing. The web site is a step into this direction and I think that’s why people are interested in it and why I keep doing it. To add some DIY action in real space, in 2002 four San Diego ( California) grrrl zinesters – Kim Schwenk, Margarat Nee, Claudia Lucero and Britton Neubacher - and me formed Grrrl Zines A-Go-Go . The group facilitates zine workshops in community venues and nonprofit organizations, and especially focuses on the empowerment of teenage girls through the production of zines and artist books. The DIY ethic is the cornerstone of the political aspect of Grrrl Zines A-Go-Go. We believe zine-making embodies the phrase “the personal is political” by encouraging active participation in the creation of one’s own culture, and independence from mainstream media. This is especially important for teen girls who discover a new avenue for expression that is uncensored; something that they can produce alone, without the need for experts or expensive tools – their tools are their mind and a pen – anyone can do it. It is a truly democratic form of media, everyone who reads a zine can create one. Every reader should be a writer, and zines make this possible, removing the fear of writing and emphasizing the process for each person. The group is still active, for news and how-to guides check www.gzagg.org. I am still organizing and conducting zine workshops and exhibits from my new home in Salzburg, Austria. You can see examples here: http://www.grrrlzines.net/zines/exhibits.htm. I am also doing research on alternative media (or citizens' media), feminism and social change. I have written my dissertation on "The Global Grrrl Zine Network: A DIY Feminist Revolution for Social Change" (funded by the Austrian Academy of Science) (at the Institute for Theory, Practice and Mediation of Contemporary Art at the Academy of Fine Arts Vienna, Austria) as well as my master's thesis on "Do-It-Yourself: Feminist Artistic Practice in Zines and Magazines . " From 2003-2005 I have been doing postdoctoral research at UCSD about discourses of social change in international grrrl zines (funded by the Austrian Science Fund). From 2006 until 2008 I have been working on a free on-line searchable database for online and print zines produced by girls and women around the world (www.grrrlzines.net/database.htm) (funded by the European Union). The database is first and foremost a tool to ensure the documentation of grrrl zines and to provide a platform for communication, networking and research. Check it out! (However, it is still work in progress...). The general goal of the web site and the database is to make international grrrl zines more accessible, as well as to establish a "living history" archive. Since September 2007, I am doing research on "Young women as creators of new cultural spaces" at the Academy of Fine Arts Vienna (funded by the FWF). I am setting up a new web site called grassrootesfeminism.net which should function as an archive and resource platform for the international feminist movement and am interviewing and researching in particular Ladyfests and DIY events as spaces and strategies where young women can create community, build activism, and express themselves culturally and politically, undermining and challenging normative, post-feminist discourses about young women’s success and choice. In all my work, I see myself more as a facilitator to the international feminist zine community and like to combine being an activist/cultural worker and researcher benefiting the community and aiming for social change towards a society where everyone can realize and live her or his dreams. Let me know if you'd like to know more! Sparking Revolutions in Hearts and Minds: In Conversation with Grrrl Zine Editors from around the World (Women in Action, Isis International-Manila.No. 2, 2003). The Power of Pen Publishing: International feminist zines and distros. In: Feminist Collections: A Quarterly of Women’s Studies Resources. The University of Wisconsin, USA. Vol. 26, no.1, Fall 2004, 20-24. For more articles I have written check the writing section of this web site. Since 2006, Haydeé Jiménez is helping me with maintaining the web site and doing research for it. She is also the one who will contact you about interviews and listings! Haydeé (*1981), grew up in Tijuana, Mexico. She studied International Relations with a focus on Latin America at the University of California, Irvine as well as at Franklin College, Switzerland. Interested in issues such as human rights, environment, migration, and local culture in relation to borders, she became project assistant for the Mobile_Transborder Archive as part of inSite_05. In addition, she has been working on electronic music projects where she uses computers and other electronic equipment to compose and produce experimental and other styles of music. as well as many Austrian and German authors such as Ingeborg Bachmann, Barbara Frischmuth, Elfriede Jelinek, Hertha Kräftner, Marlen Haushofer, Christa Wolf, Rosa Mayreder, Ilse Aichinger, Marie-Thérèse Kerschbaumer, Marlene Streeruwitz, Christine Nöstlinger ... and much more!! 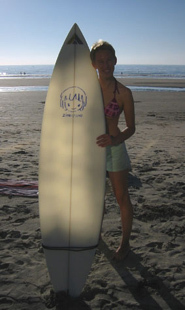 And by the way, I am learning to surf!!! I just got a new surfboard with the best design ever! 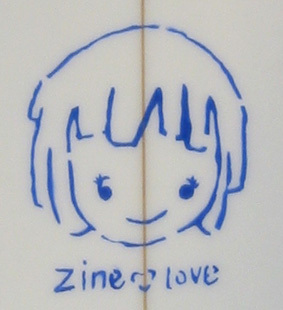 I discovered a "zine love" button at the Santa Barbara Zinefest (2002). I found out who designed it - it's the fabulous Nidhi who has done many zines. I asked her for permission to put the design on my surfboard - and here it is! Now I am paddling around the ocean and look straight into the girls face... What do you think? Isn't it the greatest surfboard design? Biggest thanks to all the inspiring grrrls, ladies and folks have met online and in real life! You all rock! Ana Rojas, Victor de la Torre, Haydeé Jiménez, Christiane Erharter, Ute Meta Bauer, Cristina Favretto, Catherine Kineavy, Kim Schwenk and Margarat Nee from the “Grrrl Zines a Go-Go” workshop group in San Diego, Eva Schmidhuber, Red Chidgey, and the Moschdlbauanbuam Robert and Willi! Thanx to all the shooting stars in my life!